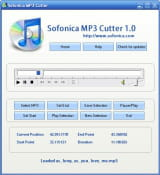 Sofonica MP3 Cutter is a severing of type MP3 audio tracks. It is compatible with the mobile phone ring tones. Extraction: everything by performing a sequencing, Sofonica MP3 Cut-ter retrieves audio content previously selected by the user and saves on the hard disk. The process takes place without any loss of quality. Simply specify the beginning and end of each interval chosen on the progress made on the interface bar. Registration: the newly obtained audio files are saved on the hard disk in the form of stand-alone files. It is up to the user to define the destination directory before starting the extraction. Player: this software includes the commands of a regular audio player which buttons Play, Pause, Stop, next and previous. There is also the buttons fast forward and the volume control for absolute control of audio files. This mini Player is used primarily to verify the quality of the rendering. Its interface is simple and ergonomic. Latest update on June 15, 2015 at 03:41 AM.